A man has died after falling from a roof at a football ground. St Albans City FC said Clive Churchhouse, who was in his 70s, "died in an accident" at Clarence Park ahead of a match with Luton Town. Paramedics were called just before 10:20 BST. Police had received reports he had fallen from the roof. 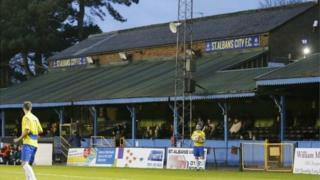 St Albans City chairman Lawrence Levy said: "We are completely devastated by the news. Clive was a much-loved character around the club." The friendly with Luton has been cancelled as a "mark of respect", the club said. It was unclear why Mr Churchhouse was on the roof, a Hertfordshire Police spokeswoman said. She said he had been airlifted to St George's Hospital in London but died from his injuries. Luton will instead play Hitchin Town in a friendly.